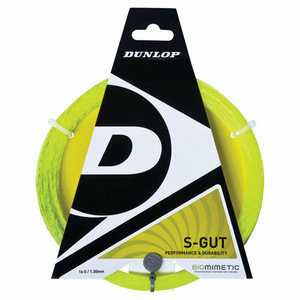 For many years players have loved using Synthetic-Gut strings. 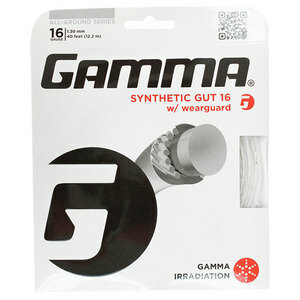 Synthetic Gut is typically a value string that is most economical for its comfort and durability. This string has gotten a bad rap over the years for being “cheap,” “inexpensive” and for having “low playability.” However, manufacturers have continued updating this type of string to give players better responsiveness, feel, and tension maintenance. Now you will see many different types of synthetic-gut strings that fit each player’s style. There are several brands that make a great synthetic-gut string and many people don’t know about them. Here are Tennis Express’ top six choices that could be a great fit to your game. Wilson Synthetic Gut Duramax is an excellent string that provides a soft, comfortable feel for players while maximizing durability. This string starts, like most synthetic guts, as a solid nylon core, but gets tensilast wraps on the outside to provide exceptional durability and tension maintenance. From personal experience, I feel that Wilson has drastically improved this string by adding more comfort. The comfort level makes this string feel similar to a multifilament, but without the fraying. The durability and tension maintenance are great for players who hit hard and break strings frequently. This synthetic gut is also great as a hybrid with any polyester strings because of its comfort levels and ability to hold tension. This string is priced at $7.25 per set and comes in White. 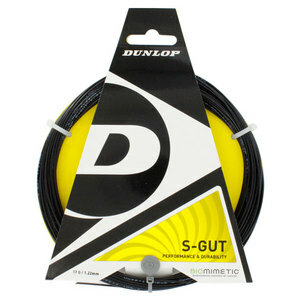 Dunlop Biomimetic S-Gut is a unique string that utilizes a large monofilament core instead of a traditional nylon or solid core. The monofilament core allows for a more solid feel and better tension maintenance. On the outside of the core, Dunlop has added outer wraps to increase the feel and soften the string bed. This is an important feature that prevents players from running into arm injuries. This string gives a lot of value to players without breaking their budget. This is another string that many players are using as a hybrid because of its comfort. This string will range in price from $3.95 to $6.95 per set or $69.95 per reel. It comes in Blue, Black, Yellow, Red, White and Pink. Gamma Synthetic Gut with WearGuard is a solid performer around the court, providing more durability and feel for players. Gamma constructed this string with a Dynalon center core to enable a crisper feel and greater tension maintenance. The WearGuard fibers on the outside of the string supply a softer feel, superior elasticity and better durability. Exclusive to the Gamma brand is their Irradiation Process which allows for a livelier and more powerful string. Players that use this string will see improvements in comfort and power without compromising on tension. This string is priced at $3.75 per set and only available in White. Babolat SG SpiralTek is gaining more and more popularity. Many players that see Babolat often think of RPM Blast or VS Touch, which are two of the most popular strings on today’s market. However, this brand has stepped up its game in Synthetic Gut. This string is a monofilament polyamide core which provides great power and a consistent response on court. Around the core is a single polyamide wrap combined with SpiralTek technology to provide added comfort, feel, tension maintenance and durability. 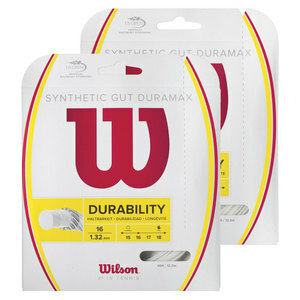 This string is great for players who want a comfortable synthetic gut with high responsiveness. SpiralTek is priced at $4.50 per set or $64.95 per reel. It is available in White, Black, Green and Blue. Head Synthetic Gut PPS is a good all-around performance string that many players are talking about. 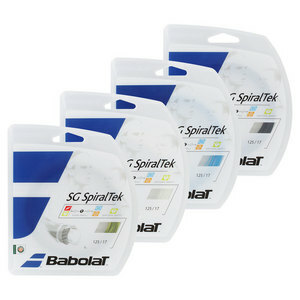 This string is similar to the Babolat SpiralTek with a monofilament polyamide core and a layer of outer wrap. Head PPS gets its name from the PowerStrip Technology, also known as Polyphenelyne Sulfide Strip. This strip adds more resilience and elasticity, which enable players to gain extra power. On the outside there is a special pearl polyamide coating which reduces string notching and burning. Players will really enjoy using this string for its feel and power. 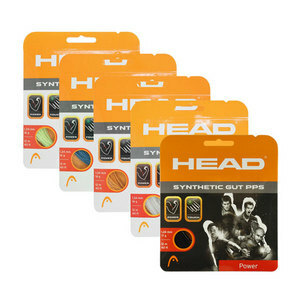 Head Synthetic Gut PPS comes in Gold, Orange, White, Blue and Black. You can purchase this string at $3.50 per set or $69.99 per reel. One brand that most people don’t know about is PACIFIC®. Pacific has made some of the top-rated strings for racquet sports since 1972. 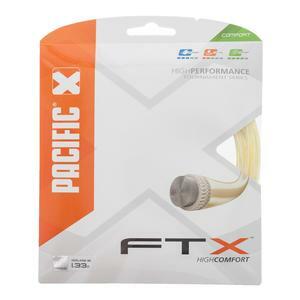 The Pacific FTX is one of their newer synthetic-gut strings that incorporate co-polymer filaments with 272 highly resilient Nylon microfibers. This string is unique to synthetic guts because it doesn’t have a solid core. The co-polymer filaments allow this string to play very comfortably, while the nylon fibers help it hold tension longer and stay durable. This is a good choice for players that have arm problems or just want a more comfortable string without getting a multifilament. FTX comes in Natural and costs $10.95 per set. Although there are many synthetic-gut strings out there, we feel these six strings stand out from all the others. Shop at Tennis Express today to order your new set or reel of string for your racquet. Also check out our blog for TE Staff’s Favorite Tennis Racquets!